"Thank you so much for yet another fantastic Walk Through the Middle Ages! Our students at Mountain View were so excited about every booth. Many are fired up to attend La Colina based on this experience. It also helps show them as 5th and 6th graders, what the expectations are at the junior high level. As far as I'm concerned, this is the best field trip I take students on every year. And from our staff at Mountain View, thank you! Don't change a thing - it's great!!!" "As a parent, I am so impressed at how you have inspired the kids to work independently on such a major project. Summer was fired up from start to finish, and it's given her such a feeling of accomplishment. Thank you for all your efforts and support." "Great event! It was nice to see all the incoming teachers and kids get so excited about the Middle Ages." "This was an amazing exhibit and event. it is obvious that the students put in a great deal of time and effort. Some of the most notable scenes included the European writers workshop, Inca Trading Booth, the Four Chinese Sisters, Knight's Law, the Magic Treehouse, Samurai Warriors, An African Household, The Emperor's Palace, and Dinner With The Queen were incredible. In truth ALL of the exhibits were incredible. I learned things and had a great time. Thank you Mr. Bergthold and Mr. Marquez and all the volunteers. A great time, thoroughly enjoyable. Thank you students for putting in so much work for this event!" "Once again... such an amazing day! This was my third AWTMA...and once again I was in awe of the whole event. Thank you for having our children learn, write, perform, and memorize their historical piece. This is a memory that they will remember for always. I appreciate your energy, enthusiasm, and commitment to our children's learning. This is not a normal teaching moment. Thank you for more than normal!" "This whole experience was amazing. The kids were very knowledgeable at their scenes and did an amazing job of acting them out. I was really impressed with the level of detail and information the kids were able to portray in their scenes." "Everyone did a gret job! We only got to see about half of the exhibits and are looking forward to coming back next year!" "A great presentation. 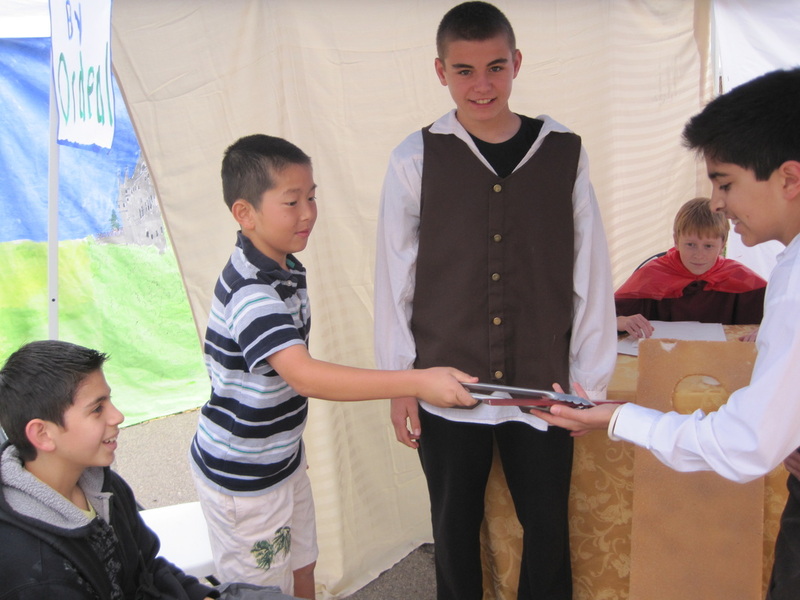 The students knew their speaking parts and were friendly to all the guests. The art work was excellent! A very successful project which shows the parents how the teachers are instructing our children in a well developed fun project." "This was amazing! The students knew the information and presented it well. Most were loud and clear. Questions from visiting classes were answered well. Thank you for this event!" "Thank you for all the support that you shared with the scholars in A Walk Through the Middle Ages! It was a fabulous day of learning!" "A Walk Through the Middle Ages was a phenomenal experience. I was thoroughly impressed by the entire event. Thank you for putting so much time and effort into preparing the kids to do this!" "The moment I stepped into the area this morning I felt I had been really transported to the Middle Ages. The effort and excellence is self-portrayed. A perfect teacher - student relation with 100% coordination. It was an amazing experience for me! And I can assure you that my child enjoyed the project from start to end! Thank you to the teachers and the school for providing this opportunity." "Very artistic! The kids showed great poise. Incredible displays. La Colina should be proud! Wonderful experience and great learning. Lots of work to make this happen. Thank you!" "All the students have incredible knowledge of their role. They all spoke with assurance. I am so impressed. Thank you for offering this great informational event!" "The 2012 Walk Through the Middle Ages was amazing!! Thank you. Thank you. Thank you for all your efforts! It is unbelievable to me that a public school has an event like this one. It rivals anything I have ever seen at the private schools. It is a brilliant concept from start to finish. The students learn so many lessons every step of the way and it is FUN. They learn how to do research, they are asked to write a challenging paper, they learn how to work in groups, they become artists and performers, they teach and engage our community, and perhaps most importantly they learn the rewards and joy of hard work and commitment. It was amazing to be a part of this process at home and at school. Watching 3 boys rehearse at my house and their genuine excitement about creating their scene was a highlight for me as a parent. I only wish every school assignment looked like this one. Congratulations on yet another phenomenal Walk Through the Middle Ages!"